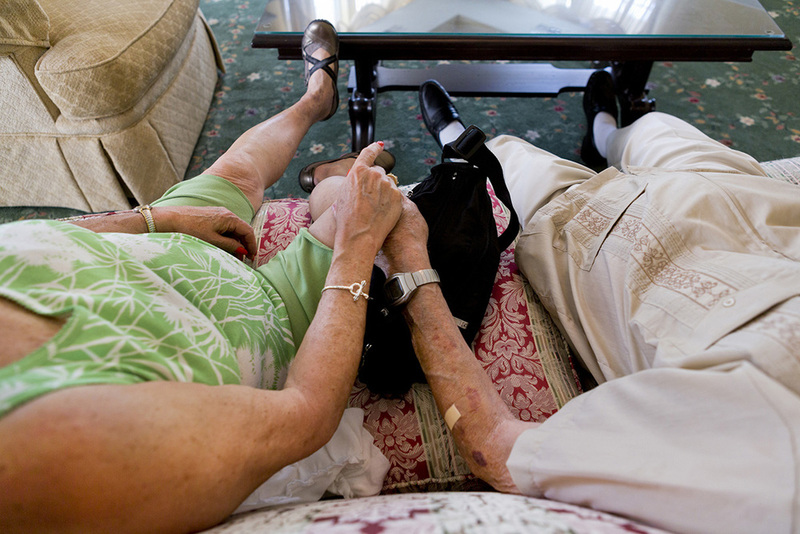 Joyce Kleber, 71, and her fiancé, Frank Maslyn, 95, hold hands while waiting for a musical performance at Legacy Senior Living Communities in Greece, N.Y. Bridesmaid Pam Devos helps Joyce adjust her gown before the wedding ceremony at Sacred Heart Cathedral. Joyce wakes Frank from an afternoon nap at their home. Since Frank is nearly 24 years older than Joyce, he needs to rest often throughout the day. Joyce and Frank dance at Legacy Senior Living Communities, where they first met. Their love for dancing keeps them coming back to the Legacy every week for musical performances. After gathering the mail, Frank passes off a wedding RSVP to Joyce. Joyce and Frank expect about 50 guests will show for their wedding at Sacred Heart Cathedral. Since Frank has been married twice before, he wanted a simple ceremony but Joyce disagreed. "I said, Frank, I've never been married; I want a wedding!" Joyce holds still as her bridesmaid, Pam DeVos, ties the back of her dress before the wedding at Sacred Heart Cathedral. Klaus Wesenberg and his wife, Trudy, congratulate Joyce and Frank on their engagement during the Senior Sock Hop at the Greece Community and Senior Center. Joyce and Frank wave to family and friends as they walk down the aisle as Mr. and Mrs. Maslyn at Sacred Heart Cathedral. Friends and family line up to congratulate Joyce and Frank after their wedding at Sacred Heart Cathedral. Frank holds Joyce's bouquet as her sister-in-law, Ellie Kleber, congratulates her after the wedding. After a busy morning, Frank admits he is beginning to feel worn out. Joyce Kleber, 71, spent the majority of her life focused on her career as a teacher. All of that changed when Frank Maslyn, 95, waltzed into her arms while dancing at Legacy Senior Living at Park Crescent in Greece, N.Y. Six weeks later, Frank proposed. "If you were to tell me, six or seven months ago, that I'd be getting married – I'd say you're crazy," said Joyce, who was used to living alone. For the first time in her life, Joyce began planning a wedding and Frank left his apartment in Georgetown Park to move in with Joyce to her home in Hilton, N.Y. Although Frank remains active for his age, he warned Joyce that she might end up taking care of him. "I'm aware that day could possibly come," she said, "but we're happy now and I consider myself blessed."